A banner of pink flowers flies above a coastal sage bush. This is Pacific pea (Lathyrus vestitus), which has clambered to this high perch using twining, curling green tendrils. Pacific pea is a California native that can be pink, white or lavender and often appears yellowish as it ages. The stem is sharply angled but not actually winged as many species in the Lathyrus genus are. The roots, seeds and leaves of this plant are edible, and tincture made from the roots was used by Native Americans as a general healing remedy and to treat internal injuries. 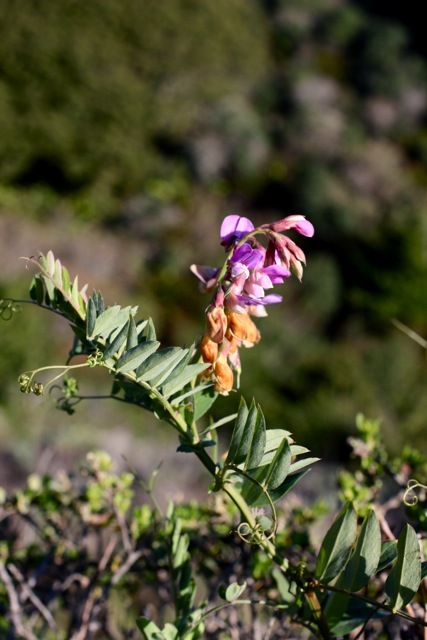 You can tell Lathyrus species from the often similar looking vetch species most easily because the flowers are generally larger–greater than one centimeter. But also tug on the petals; if the upper (wing) petals are partly joined to the lower (keel) petals then you have one of the large vetch species, not a pea.